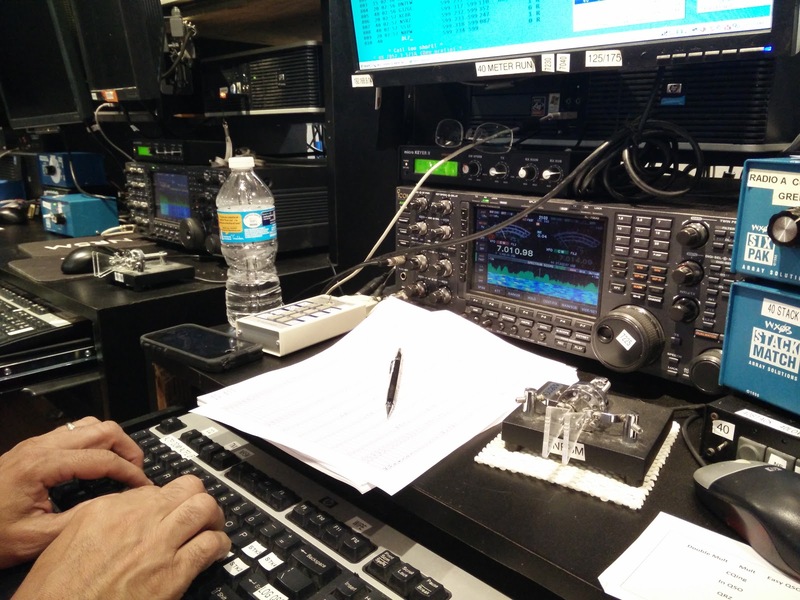 This weekend was the CQ WW WPX contest and I was invited to go down to Hempstead, TX (about an hour outside Houston) to operate at the NR5M super-station. I drove down on Friday night (3 hours and 40 minutes or so) so I missed the first few hours of the contest. When I arrived, the sun was just setting and I'm sure I had a stupid look on my face as I saw the towers rise over the horizon. What a sight to behold. I was ready to quit driving so I didn't stop for a picture unfortunately. The station is set up primarily for Multi/Multi style contesting. Each position has an IC-7800 or 7700 (more on these later) for the runner and an IC-756 Pro III for working mults. I suppose you could do SO2R but none of them were set up that way as far as I know. microHAM interfaces controlled the hardware and software lockouts between the mult and run stations which was neat. 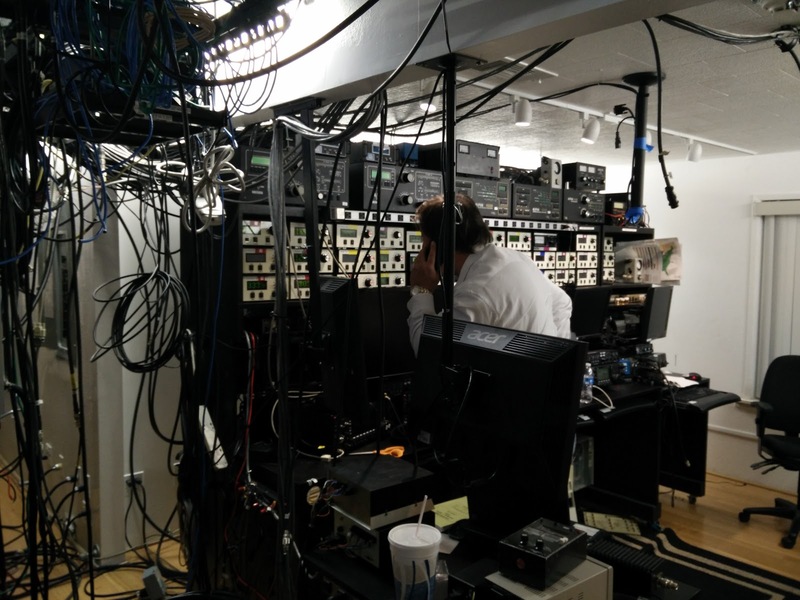 I know we tried to do some of the 2 operator style operations at N0MA, but without the lockouts, coordination had to be better and without practice, its a little tough. Alpha 77S amplifiers on all the stations put us at 1,500w everywhere. I got a feel for the layout a bit then sat down with K5GN, David, to work mults on 40m. David was a referee at the World Radiosport Team Championship in 2014. Let me tell you, he is an amazing contest op. The picture above is him at the run position on 40 while I was sitting beside on the mult position. We worked this way for a couple hours until he had to get a bite to eat or something when we switched spots. I was still pretty rusty but I had a decent pace going and the mults were weak and few so David sat on my call frequency and listened on a different beverage than I was; a sort of 2 person diversity receive I guess. Remember, the 2nd radio is a Pro III. Not particularly known for its astonishing receiver. Still, David would hear stuff in the noise or pull callsigns out of pileups like magic. Its almost like he had a 6th sense for signals below the noise floor. I was really impressed and he was an amazing coach too. 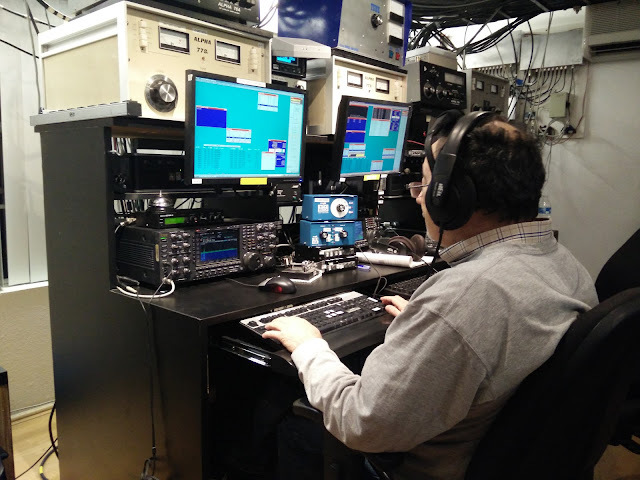 He was very encouraging and I learned a lot in the few hours we worked together on 40m. He left in the morning so I didn't get to pick his brain any more unfortunately. Main points of help were being more confident that my copy was correct, asking for fewer repeats means more qsos. Less hesitation when replying to a station or providing a fill. I know some of this was nerves and unfamiliarity with the station operation and computer macros for keying. I caught on a bit as time went on. 30-ish Green Heron rotor controllers?! 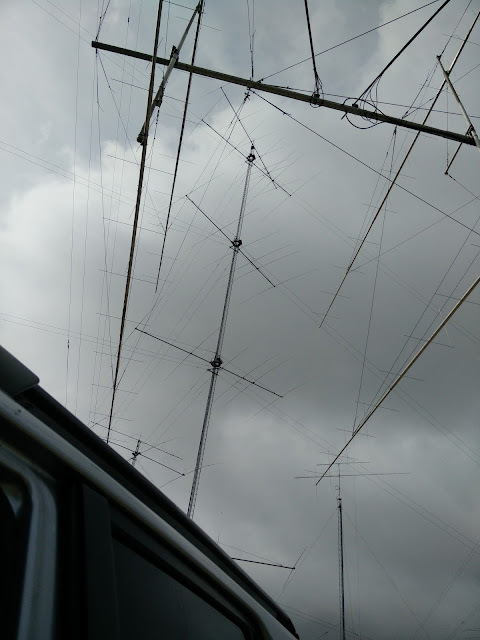 Here's just a few pictures of the antennas from the parking area by the shack. 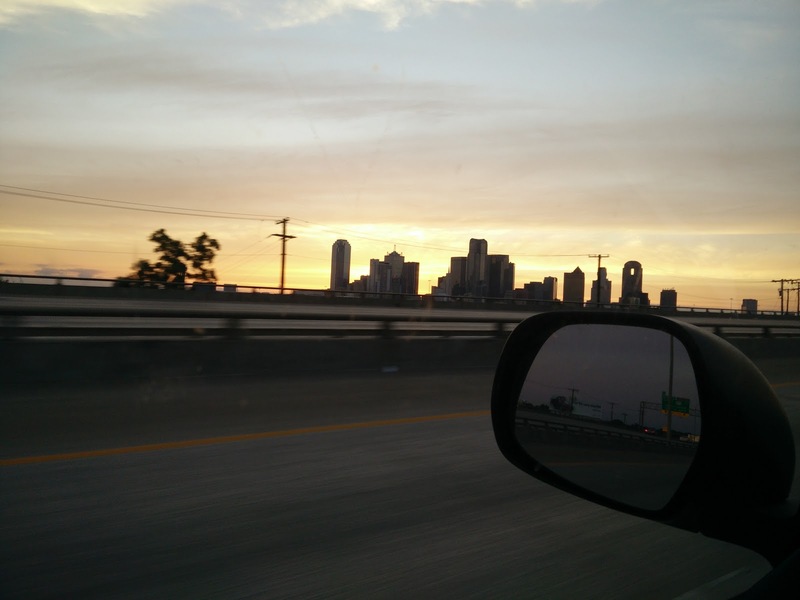 Downtown Dallas as I returned home right at sunset. We rounded out the contest with over 22 million points, demolishing the previous W5 record of 13 million. Even after errors we should be on the books for a long time. I only operated Friday night and most of Saturday morning and early afternoon before I went home Saturday night. We had spent the last weekend moving to the new apartment and I was coming down with what I think is bronchitis now so I wasn't really in the shape to pull another late night. Plus the bands were slow and signals were weak and I just wasn't having too much fun of it. I guess I'm just not really cut out for 48 hour contests. Maybe if I had more time to recover. So what did I get from this operation? I learned that there are lots of aspects of N0MA that I miss, but some that I don't. I miss the guys up there, they were a lot of fun to operate with. I miss being competitive but treating a victory like a surprise rather than a requirement. I like NR5M though. 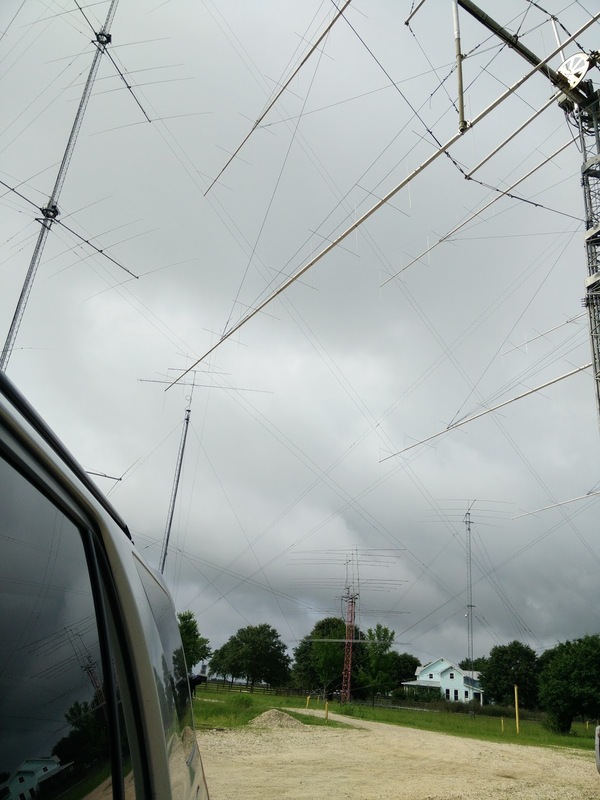 The antennas are unlike anything I've seen or used before and the operation is smooth and not nearly as chaotic as things can be at N0MA. 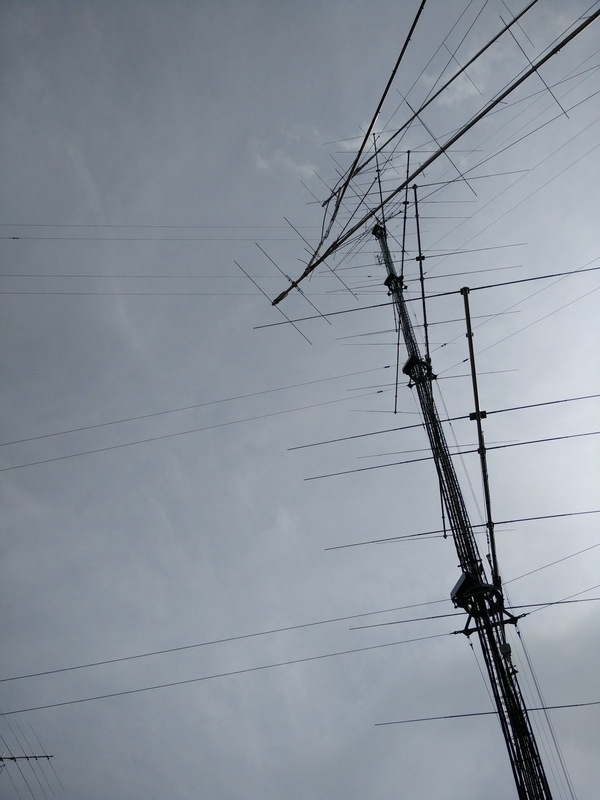 There were some hitches at NR5M but the extremely highly redundant antennas helped keep that from being a big issue. At N0MA if we lost an antenna for some reason, it'd probably be the only one on that band which would require immediate action. It required more work and participation for sure. I should have helped out a bit more while I was up there. 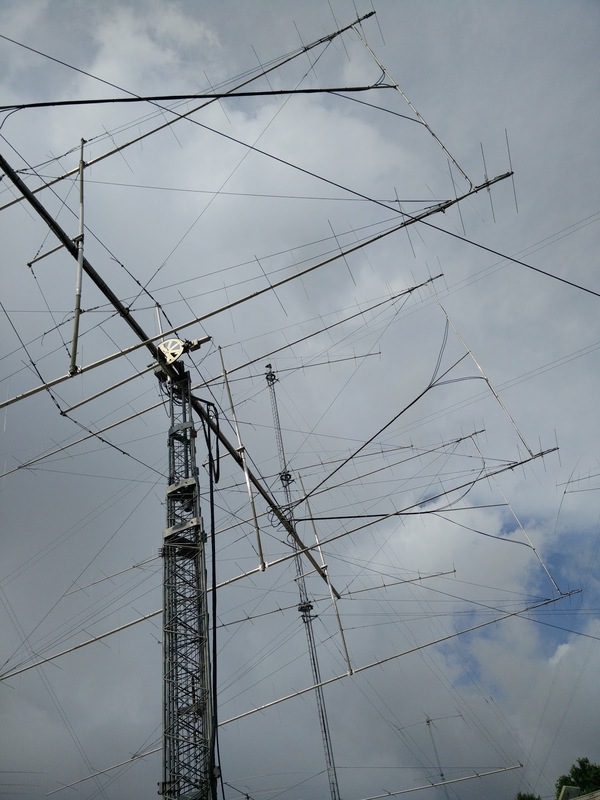 I was pleasantly surprised with the operation of the IC-7800s. They are not top 10 radios by any means but they certainly held up well in the multi/multi environment. Interference between bands was a total non-issue (surely due in part to great external filtering on all the feedlines) and inter-band interference was low and typically somewhat manageable depending on which radio you were listening on (the 7800 completely destroyed the Pro III receiver while I could usually survive on the 7800 if the Pro III was transmitting nearby). All the controls on the 7800 you would need are at your fingertips, I didn't have to touch the menu system which I think is a very important feature of a contest radio, especially one I'm not familiar with (like the K3). I still find it terribly annoying that radio companies are doing passband tuning instead of width/IF shift like my 590 does. Passband tuning makes it a lot more difficult to quickly null out offending QRM in my opinion. The band scope feature on this radio is about as useful as others in this class. Built-in one's just don't do much for me. A true IF pan-adapter will destroy this thing with ease. Long story short, if I were offered a free 7800, I'd be happy to have one. I would never buy one though. Still, if you're in the market for a contest category radio, and have access to one, give it a shot, you might like it more than I did. In closing, I ask myself if I'd go down again for the next big contest, and I am not sure. It is a very long drive and I think I do prefer a more casual operating style, but it may be a different group of operators at the next one too! I guess we will see what happens next. It was nice to be asked to join the group and I'd certainly consider it again.